This is “Holy Matrimony,” a rather silly movie with one of those preposterous plots in which logic is thrown out the window, but watchable because of the performances, especially if you only know Monty Woolley from “The Man Who Came to Dinner.” Eric Blore is wonderful as always, although he gets killed off early in the film. I was surprised that nobody pegged Gracie Fields. And look how young Whit Bissell was. This is his second film. And for Tuesday, we have a mystery chap at the pipe organ. And here is our mystery woman for Wednesday…. And for Thursday we have a very young Oh Him and the famous Oh Her. For Friday, our mystery chap has a beard of the Van Dyke persuasion. Well that’s an interesting guess. But alas, no. A very weird view of Edward Everett Horton?! Hans Conried wearing a hairpiece? Something about the first photo makes me think Boris Karloff. The second photo says “not even close”. I need more coffee. Wednesday’s mystery actress is in reality Alec Guiness in Kind Hearts and Coronets. Is that Mary Clare Wednesday? Let’s try Henry Wilcoxon for Tuesday. On Thursday I see Whit Bissell, Una O’Connor and ??. HOLY MATRIMONY. Charles Knight Monday. Whit Bissell and Una O’Connor today. Wow. A fascinating guess. But, no. Sorry. Thanks to the Thursday mystery group, I finally think I’ve guessed which film it was. Holy Matrimony, 1943. With Una O’Connor and Whit Bissell. I’m just waiting for you to show Monty Woolley! Well, the man with Oh Him and Oh Her is Whit Bissell. Don’t know the movie. Thursday Looks like Whit Bissell on the left, and Una O’Connor on the right. I’ll take a guess: Cluny Brown, and maybe Peter Lawford in the center. Alas, no. Bob Hansen is the first to identify Thursday’s Oh Him and Oh Her and Mary Mallory is the first to identify the film. Congrats! Oops! I meant Eric Blore and Monty Wooley. Whit Bissell and Una O’Conner in Holy Matrimony. Charles William Knight is the organist. I believe this may be “Cluny Brown”. 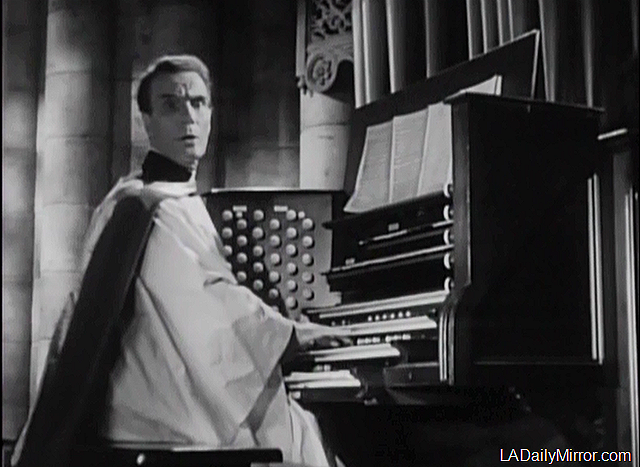 Is it Richard Haydn on the organ for Tuesday and Whit Bissell and Una O’Connor for Thursday? Our new guess is Holy Matrimony for the movie. For Thursday Michael Gough and Mildred Natwick, athough I suspect they never worked together. Or how about Hugh Marlowe and Natalie Schafer in Marriage is a Private Affair. Sorry, late to the party. Laird Cregar today along with Monty Woolley and Eric Blore. Whit Bissell and Una O’Connor yesterday make this Holy Matrimony (1943). Cregar will pass on next year at 31, from a heart attack. Laird Cregar, Eric Blore and Monty Woolley. Laird Cregar plus Eric Blore and L.C. Monty Wooley clinched it! Holy Matrimony. And that color shot of Laird Cregar looks like it’s from Heaven Can Wait. My all time favorirte actor Eric Blore in Holy Matrimony. Friday:Creepy Laird Cregar, then Monty Wolley and Eric Blore. Film: Holy Matrimony 1943. Our computer has been down for three days. HOLY MATRIMONY 1943 with Monty Woolley, Laird Cregar, Whit Bissell, Eric Blore, Una O’Connor and Gracie Fields just around the corner. Without a computer for three days? I can’t imagine!! Welcome back to the online world. The film is “Holy Matrimony”.